With Mother’s Day around the corner, I’ve been thinking a lot about my two sons. (My sons would tell you I never stop thinking about them!) Both of my boys are twenty-something, done with school and largely independent. They don’t need dear old mom the way they once did. Consequently, I've had a little more time to pursue a few personal interests. One of my interests is looking for ways to live healthier and reduce my carbon footprint. Next to showering my sons with love and support, I can’t think of anything more important than taking care of myself and our planet for them. As a result, I have encouraged companies with natural products, especially ones made in responsible ways, to contact me. I'm interested in finding good products and sharing them with Flattering50 readers. Recently, Hannah, founder of Sienna Naturals, sent me samples of her Baobab Oil Moisturizing Collection. The collection is specially-designed for women of all ages who are looking for natural solutions to combat dry skin and hair. Here's my review. 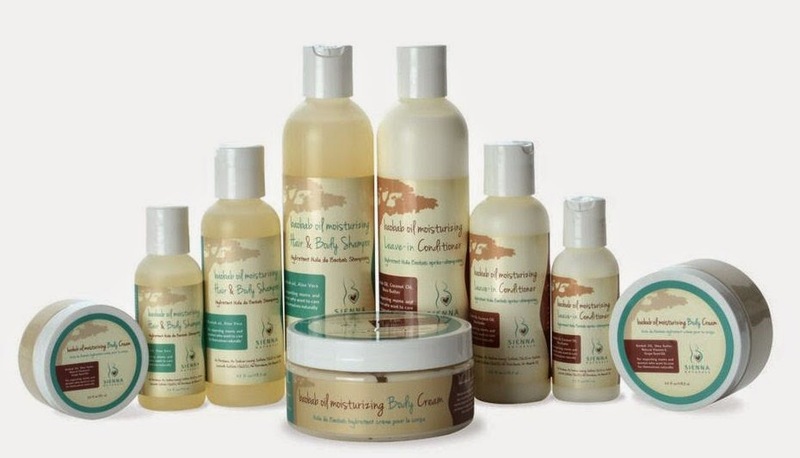 The Baobab Oil Moisturizing Collection includes a hair and body shampoo, conditioner and body cream. Before agreeing to try the products, I looked at the ingredients. Apparently, Hannah, who has had dry skin and highly textured hair all her life, is as concerned as I am about avoiding parabens, sulfates, petroleum and other harsh chemicals. When formulating her products, she avoided all those nasty ingredients. Instead, she chose Baobab Oil, a natural moisturizing substance derived from the seeds of the Baobab tree in West Africa, as the key ingredient of her product line. And what makes the new product line even more exciting: the Baobab oil is acquired under fair trade practices from West Africa. I love that! The collection's shampoo can be used either for your hair or body. I've used it several times on my hair. The shampoo, which is made with the Baobab Oil plus aloe vera and vegetable glycerine, creates a soft lather. I like the light, fresh scent, which is derived from the essential oils of lavendar and geramium. Unlike my experience with other shampoos that leave my hair dry and tangled, the Sienna Naturals moisturizing shampoo left my hair surprisingly manageable. When I used the shampoo alone, without a rinse-out conditioner, I was able to slide a brush through my hair without hitting a lot of knots. That's unheard for me! Normally, I wouldn't dare wash my hair without applying a conditioner immediately afterwards. Since menopause, my hair has had the consistency of a dead lawn. However, Hannah recommends using her conditioner either before shampooing, as a rinse-out step, or as a leave-in moisturizer. So...I decided to try all three methods. The conditioner's combination of ingredients--Baobab oil plus coconut and shea butter--sounds heavy, but it isn't. I found the conditioner easy to apply and wash out when I used it as a pre-treatment and a rinse-out step following shampoo. However, my favorite application was as a leave-in conditioner. Following Hannah's advice, I applied a small amount (pearl-size drop) to my hair tips and combed it in. I continued to apply drops of conditioner as I worked towards my roots. It took a couple of hair washing/conditioning to figure out the right amount of leave-in conditioner. (For my hair length and texture, it only takes 2-3 drops.) Now that I've got the hang of it, though, I'm quite pleased. My hair looks and feels the best it has after using at-home products in years. It's more manageable and less dry looking and feeling. Hannah recommends using the body cream after a bath or shower. I read somewhere that moisturizing after a bath/shower is the best time because the hot water opens your pores, thereby absorbing more of the cream. The body cream, which includes Baobab oil, shea butter, and grape seed oil--is lightweight, but very moisturizing. Lavender and vanilla extract create a light scent. Hannah recommends using the cream all over. I've become a bit of a fanatic about moisturizing my arms (especially with the warmer weather on the way) and really appreciate how smoothly and evenly the body cream covers. As we all know, it's very easy to spend a fortune on beauty products, especially skin care. I was happy to see that the Baobab Oil body and hair shampoo ($18 for 8 oz. ), conditioner ($16 for 8 oz.) and body cream ($24 for 8 oz.) have moderate price tags. The fact that I needed to use a lot less of these products than I do with the typical drug store brands makes the products an even better value. And, of course, I like the peace of mind of knowing I'm using products without harmful ingredients. You can learn more about the Baobab Oil Moisturizing Collection at the Sienna Naturals website. If you'd like to try the products, you can purchase them on the Sienna Naturals website or on Amazon.com. There is a travel size ($12) of the collection (below), which might be a perfect way to test the products on your hair and skin. In the meantime...Happy Mother's Day! !